Sonic - Code Gray is a hack of Sonic the Hedgehog by Jdogg. This hack features new layouts, art, music, and ASM edits. 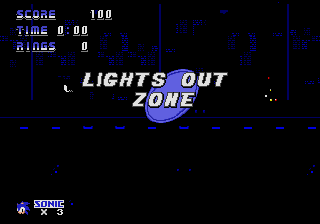 Another feature is "Lights Out Zone", a challenging custom-built level which can be accessed by hitting the "?" monitor. Completion of the zone awards you with an extra life/1200 points and warps you to LZ1. This page was last edited on 13 April 2018, at 13:32.